Coming home was easy, but leaving was difficult. Even after two wonderful years as a Peace Corps Volunteer in the South Pacific, I still wanted to come home to walk among the shelves of a bookstore, shiver in the aisles of a supermarket and sit back in stadium-style seating at a Cineplex. America, I always thought, has what I relish: great choices of books, music, movies, food and family. One day on Paama, the small island where Erin and I served, I had had an irresistible urge to be in an American airport, a place of confluence that reflects our freedom of travel and opportunity. I just wanted to float amiably among the crowds. But once I was back from Vanuatu, other emotions collided with that sense of largesse. I was walking among the crowds crossing the street to Chicago’s Water Tower Place, and I wanted to scream out, “I just want to be recognized!” All these people, coming and going and rubbing elbows with me, but not one stops and greets me. On Paama, most mornings before school I would walk up the hill to the Lironessa Village cooperative store, a few hundred yards from Liro Village where Erin and I lived. Our dog Geo led the way, and sometimes Pima the “puscat” would follow us. On my way up, and on my way down the rutty dirt road, I was greeted by the villagers. We would come face to face, stop, shake hands with one pump down, and repeat the same refrain. The villagers knew me. They knew my whereabouts, and my comings and goings. They knew when I stayed up late reading, and when I brought a shipment of tomato sauce and pasta from the capital, Port Vila. They knew when our parents called on the phone, and when a pile of packages arrived at the postal desk. And when they knew these things, they stated so. The handshake became routine. In a communal society where physical intimacy is never public, the handshake was an important bond. Even this could last. I’ll always remember Noel matter-of-factly holding my hand as he and I walked up the road to the store together. Noel was my brother. To him and to me, and to the village of Liro, we were true brothers. Sure I was white-skinned and he was black, but from the moment Erin and I arrived on Paama for our training (the nine weeks before we were sworn in as volunteers and sent back to serve Liro), we were family through and through. We shared meals and exchanged gifts, talked about our cultures and laughed about our foibles. Noel’s children Terry, Enna and Mereva became our children, and spent nearly as much time at their own home as they did at ours. They were the village that raised Erin and me to an understanding of community. We gathered at the Tavie airstrip on a rainy October afternoon. That simple cement structure, for a few hours, was more airport than sprawling O’Hare might ever be for me. Among the crowd, I was recognized — as servant, as envoy, as friend and as family member. I climbed aboard the tiny Twin Otter airplane and began the journey home. On the plane, banking past Paama, I was too tired for tears. What I thought about was Idaho, when I was 10 years old. My father, Joseph, took all of the sofa cushions and created a hockey rink in the living room. We played a version of floor hockey with wooden spatulas and spoons and a Wiffle ball. By then, I’d already wanted to be a Peace Corps Volunteer. In that same living room dad regularly showed his Peace Corps photos on the bare white walls, using a finicky slide projector and a Zuiker penchant for storytelling. The Peace Corps never had so good a recruiter. We started with a few days of shopping in Auckland, and stayed at the home of a Vanuatu acquaintance, Erin Crowley. We then toured the country in a campervan. New Zealand even in winter was inviting, the people friendly and the scenery spectacular. We kayaked in the Marlborough sounds (Sea Kayaking Adventure Tours guide Roger was great); swam with 1000 dusky dolphins in the chilly waters off Kaikoura; soaked in the cauldrons of Rotorua’s hot springs; and toured the respectable wineries of Hawkes Bay (best was Huthlee Estate Merlot, unavailable in U.S). A great destination, especially for outdoor enthusiasts; summer, North American winter, is much more expensive than the off-season winter. Alison Todd, who once served as a nurse on Paama for 17 years, hosted us in Sydney. She drove us up to the scenic Blue Mountains, and gave us terrific instructions for navigating Sydney, where we toured the Olympic Stadium complex, caught an opera, “Turandot”, at the famous Sydney Opera House, and napped on Bondi Beach. From Sydney we flew to Brisbane, where we met some koala and kangaroo. I later ate a kangaroo steak at the eccentric Going Bananas restaurant in Port Douglas; the kangaroo meat was unique, but what is most memorable from that meal was the prawn-filled lychee appetizer! In Cairns we caught a day-sail out to the Great Barrier Reef, a must-see with a stunning display of coral and fish. I saw my first shark ever, a black-tipped reef shark that lazily swam beneath me. The hostels in Australia are cheap, clean, friendly and fun. This was to have been a 12-hour layover, but we extended it to a full four days. Bangkok is huge, loud, busy and polluted. But we loved it. We took a fabulous day tour north to the ancient ruins of Ayuthaya and at one point cruised the main river in a long-tail taxi boat. In Bangkok we learned to bargain at the Khao San Road area, where backpackers from around the world converge. One day, Erin and I took a taxi to an off-the-main neighborhood and wandered until we found a noodle shop, where we slurped multiple bowls of noodles and bottles of Coca-Cola, all for under a buck. Thailand is super cheap. Go, but spend your time out of Bangkok. Our good friend Charles McCarthy, the Franciscan friar who married us in Cleveland in 1996, met us at the Copenhagen airport? he recognized us!? and took us to his friary in nearby Roskilde. Denmark was frightfully cold, but we loved the Scandinavian reserve and the country’s clean design sense. We enjoyed the simple pleasures of shopping in the cobblestone streets of Roskilde and Copenhagen. One afternoon we took a ferry to Sweden, passing the Kronborg Castle, which Shakespeare used for Elsinor Castle in Hamlet. The hospitality of Charlie and his fellow friars was truly special. 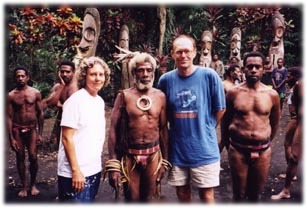 In Vanuatu, we had met Knut Rio and Annelin Eriksen and their two daughters, Anna and Oline; Anna, Oline and Erin all shared the same doctor when the three had malaria. In Bergen, we celebrated the good health of all of us. Norway was even colder than Denmark, but we barely noticed since the scenery was so spectacular. Knut and Annelin guided us past fjords, into the mountains, and around traditional Norwegian cuisine? such as smalahove, boiled smoked sheep’s head that is a delicacy in the mountain village of Voss where we stayed in a quaint cottage on Knut’s family’s farm. 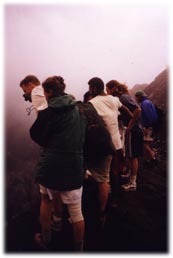 Around the same time I determined I would be a Peace Corps Volunteer, I began my fascination with Norway. So, visiting Knut and Annelin was a dream come true. A more recent dream was my desire to visit the modern-day cathedral-like museum built by architect Frank Gehry in this northern Spanish city. This was a fantastic experience, and the Guggenheim museum is truly a masterpiece of modern art and architecture. We were in Bilbao for two nights only, but that was long enough for me to practice some Spanish. We must return to sample more of the famous Basque cuisine. We missed out because we walked the streets from 5 to 9 looking for an open restaurant, when if we’d bought a guide book and read the print we’d have known that dinner isn’t served until after 9. Next time. Ahh, Paris. We relied on Erin’s cousin, opera singer Julie Braun, and Julie’s journalist boyfriend Tom Haines to guide us. And they did a fabulous job showing us Paris. We visited the Louvre, the Eiffel Tower, a handful of restaurants, and the subways. We celebrated an American Thanksgiving with Greg Frost and Paige Bradley, friends of Julie and Tom. I can’t wait to get back to that city. Here we stayed with a good friend of Erin’s sister, Mary. Libby Reicard landed a great internship with a Fransiscan organization that advises the United Nations Human Rights Commission. Libby was new to Geneva, but was a good guide nonetheless, and showed us the Hall of Nations that was once the forum for the League of Nations. Of course, Erin and I bought watches. Good ones, too. And we finished in England. Barbara and Steve Watson (Barbara is the sister of Dot, my father’s wife) hosted us on their 1909 Belgian houseboat on the Thames. Barbara drove us to Stonehenge and then to a nearby but much-less-crowded presentation of stone monoliths at Avesbury. Erin and I saw the play “Art” in London’s West End theatre district, and the new James Bond film and “Eyes Wide Shut.” For the first time in months, Erin and I split up for the day: she visited the historical Westminster Abbey and I went on an architectural tour of London’s Canary Wharf development. One afternoon we enjoyed brunch at the home of Alex Frater, the grandson of the first missionaries to Paama. 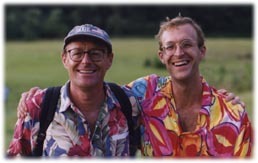 Alex, an accomplished travel writer and journalist, visited Paama in late 1998 and suggested that my goal of being editor of National Geographic Magazine isn’t so far-fetched after all. Thank you, Alex. By mid-December Erin and I were home in the Midwest United States. We had a mini Zuiker reunion with my mother and brothers in DeKalb. I’d missed both Joel and Tracey’s wedding and Christopher and ElizabethÕs wedding, and now for an early Christmas they brought babies. Our family does continue to grow. Only a few weeks after returning to Cleveland I was offered a job, recruited by a former mentor to join an Internet start-up company creating a how-to website. In the four months since I joined PlanetKnowHow.com, I’ve had a crash course on the world wide web? I went from living on a technology-simple island to relying on a handheld computer to keep track of my busy life. Erin, too, is working on a website. Hers is a university-funded project to create an online tool for helping people of low income or high debt find the tools for owning a home. And that’s where we’ll leave off. I’m home now, and happy to be here. “Yu stap gud nomo?” Let’s shake on it.